An imaging system and method for producing an image based on primary radiation. A separate image based solely on scattered radiation may also be obtained and may be of practical interests. The separation of primary and scattered radiation is achieved by utilizing a small beam exposure and a cone beam exposure, then the primary and scatter images are reconstructed based on a pencil beam model or from a Monte Carlo method. Other embodiments disclosed include two-layer detector arrays or volumetric detector arrays that measure the relationship between the dose and the position, from which the primary and scattered radiation can be extracted. In addition, by limiting a readout time of a detector, primary radiation component may be read because of a delay in the scattered radiation. Cone-beam CT imaging may have its signal-to-noise ratio improved by about 20% using this technology. 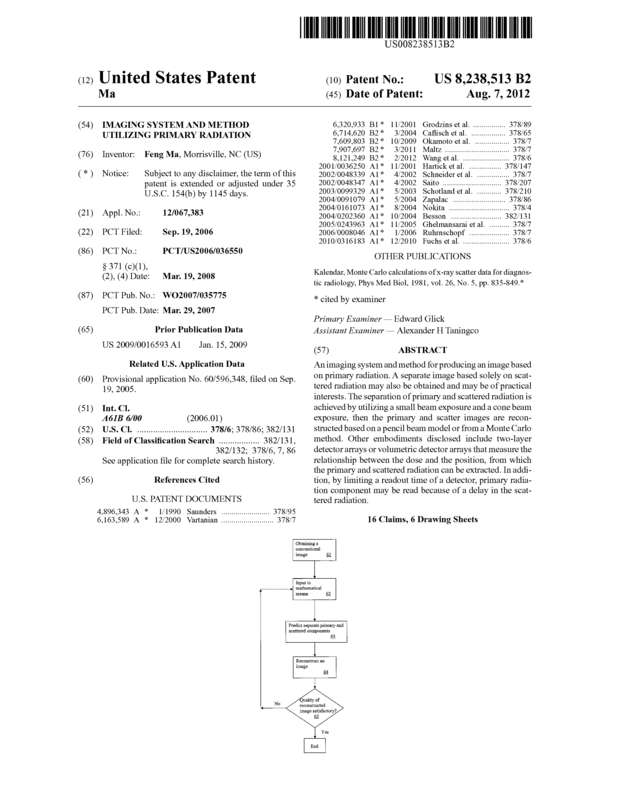 Page created at 2019-04-22 14:42:00, Patent Auction Time.